The Hungry Ghost Festival or Yu Lan is the time of year when, in Taoist and Buddhist beliefs, the gates to the spirit world are opened and the deceased walk the earth again searching for their living relatives, potentially angry, and definitely hungry. One night a couple years ago, I was walking back to my apartment in the Jordan neighborhood of Hong Kong, when my path on the narrow sidewalk was almost completely blocked by a spread of food.White styrofoam containers full of glazed, crispy skin chicken, fried noodles, dark green vegetables, and Chinese barbecued pork lay open on the sidewalk next to a tin of smoking incense. Nearby, a woman was busy standing over a large metal bowl, feeding colored paper into an orange flame. The fresh, tidy “banquet” sat in contrast to the patina of ages old grime that shaded the concrete and tile buildings that populated my part of Kowloon, the peninsula that along with Hong Kong island makes up the city of my birth. Looking further down the street, a street popular with superhero filmmakers to portray “gritty”, and “Asian”, the copious neon signs advertising restaurants, spas, and jewelry shops looked dreamy under the haze of more incense, and smoke leaping from fires in metal bowls and barrels. The smell of greasy food and burning paper filled my nose, a sweet, earthy smell that almost covered the scent of sweat, salt water, and garbage that perpetually perfumes Hong Kong. Don’t get me wrong, “sweat, salt water, and garbage” may not sound like a treat for the senses, but something about the smell of Hong Kong soothes my soul. However that night, mine was not the soul to be soothed. It was the Hungry Ghost Festival in Hong Kong, and the streets were alive with offerings to the dead. In places like Hong Kong, China, Taiwan, Thailand, Malaysia, and Japan, the seventh month of the lunar calendar is considered ghost month (a little different every year on the western calendar, this year ghost month was August 22 to September 19). The 15th day of ghost month culminates with the Hungry Ghost Festival. On this day it is vital to offer sustenance to your dead ancestors – or any other ghosts that might cross your path. Otherwise they will haunt you, or even worse, curse you. Haunt you or curse you. Though I definitely respect the seriousness with which many people – including some in my family – approach ghost month and the Hungry Ghost Festival, as a child growing up straddling old Hong Kong superstition and wanting my MTV, the threat of, “Ai-yah! You’d better be respectful, or your ancestors will haunt you and curse you with bad luck, “lah,” seemed to be the warning attached to every ritual, event, or holiday. I think my mom even worked it into Christmas somehow. It’s just fascinating to me that in cities like Hong Kong, that are known largely for their modernity and fast-paced business dealings, fear of retribution from ghosts and the dead still permeate the society. But I digress. During ghost month, the ghost gates open at sunset, and the spirits are free to roam the realm of the living in order to seek out their relatives. The ghosts might be angry because they were not ready to die, they have unfinished business, or they are in Hell. One reason a spirit goes to the deepest pits of Hell is because their family mistreated them, forgot them, or didn’t properly bury or cremate their body. Additionally roaming the earth as an angry disembodied spirit makes you HUNGRY. So in order to appease the spirits, the family must lay out food for the dead – usually outdoors, sometimes in the home. Not a few scraps, not a cookie or leftovers, we’re talking actual, fresh food. Some say you should provide the best you can afford. For the entire ghost month, my street in west Kowloon was never without take-away boxes of food placed on the sidewalk after dark. Some laid out red cloth or flowers for the food to sit on, others placed bottles of water or beer alongside the offerings. It was all about giving people’s ancestors their favorite foods, or pleasing passing spirits so they wouldn’t bother the inhabitants of someone’s home or shop. I’m not quite sure what happened to the food laid on the sidewalks after the ghosts had a taste. Since Hong Kongers are superstitious yet practical, I suspect the food ended up being consumed. I rarely saw leftovers sitting out in the morning (thought I often saw the remnants of a squashed meal that had been run over by a car). Of course, not all ghosts can find their families. Sometimes, the dead return to the home where their family used to live, only to find a stranger living there. Woe be to the stranger who doesn’t acknowledge the dead! If nothing else, whether you’re planning on hosting your returning ancestors or not, it’s recommended that you always have a light on in your home – as ghosts hide in the shadows – and always have at least a small offering of food out. An orange, perhaps a beer. Above all, the dead must not be forgotten. Oh, and first rule of ghost month, don’t talk about ghost month. Specifically the ghosts of ghost month. Hauntings and curses abound. 1) Don’t begin a new job, get a new home, get married, be born, or do anything new during ghost month. Your new beginning may be doomed. If you have to be a special snowflake and be born during ghost month, only celebrate your birthday during the daylight hours. 2) Ghosts are drawn to red, so don’t wear red or else a ghost may attach itself to you. 3) Don’t pee on a tree. A ghost may be living in that tree. 4) Always close exterior doors, you don’t want to invite in wandering ghosts. 5) Don’t lean on walls – ghosts stick to walls. 6) Never disturb a ghost’s food and offerings. If you do, apologize profusely. 7) The night is not yours during ghost month, it’s for the dead. Unless it’s in honor of them, don’t do things outside after dark. Along with food, the living also burn paper for the dead. At night, little charred bits of Hell banknotes would float through the air in my neighborhood. Yes, the dead have their own currency, and it’s the job of the living to make sure the dead have enough money in the afterlife to maintain the life they were accustomed to. So Hell banknotes are purchased from shops devoted to selling paper goods for the dead – including but not limited to paper computers, cell phones, iPads, cars, and designer clothing – and burnt in order to make a deposit into the dead’s wallet. These days, the dead can have pretty much any luxury they want – as long as their family burns it. On the night of the Hungry Ghost Festival, the link between the world of the living and the world of the dead is strongest. Families often hold banquets in their home, honoring the dead with empty chairs at the table, held for the guests of honor. The plates for the dead are heaped with their favorite food, their cups filled with their favorite drink. Part of pleasing the dead is entertaining them, so public music and dance performances may take place in the street or parks. In Hong Kong, Chinese opera companies hold pop-up performances in public places to honor of the dead and the deities. Colorful, temporary shrines and temples appear throughout the city, so that people can stop to pray for the dead. After the festival and ghost month concludes, if families have done right by their dead, they can go back to the spirit realm with a full belly, a happy heart, and a heavier ghost-wallet. Until next year. I love ghost month in Hong Kong. I was lucky enough to be there for the tail end of it this year. And though the offerings after the 15th day of the lunar calendar had largely been reduced to incense and oranges, maybe some sweets, there was still an air of remembrance and ritual on the streets of my old neighborhood. Even as the area slowly gentrifies with the enormous cultural center being built on the harbor, the Ritz-Carlton’s tallest bar in the world only streets away from historic Shanghai Street, and posh European-looking apartment buildings dotting the neighborhood, the 2,000-year-old Hungry Ghost Festival endures. Whether you believe in ghosts or not, the Hungry Ghost Festival is a time to think about the dead. More than the dead, one’s dead family. Since many in Asia believe that the spirit survives when the body fails, you might consider this just another way to care for your dead. On one of the last nights of ghost month this year, I walked past a women in Jordan tending a fire in a squat, metal barrel. Taxis zipped past her, a loud group of people who were headed to the next bar jostled by, a nearby convenience store unloaded boxes from a truck. Life bustled around her, the city went about its business. But she just quietly, meditatively stoked the fire. From a distance, I watched her burn some paper offerings. They incinerated in a little puff of smoke that rose to the heavens. 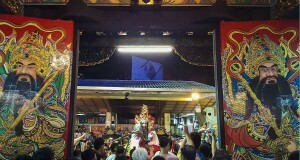 And that is the beauty of the Hungry Ghost Festival. Under the glow of neon signs, Hong Kong is aggressive about moving forward, forward, forward, faster, faster, faster – chasing life. In a way, Hong Kong is aggressively alive. But amidst that bright, unyielding life, there is some peace in knowing that lurking in the shadows, there is still room for the dead. Louise Hung is an American writer living in Japan. You may remember her from xoJane’s Creepy Corner, Global Comment, or from one of her many articles on death, folklore, or cats floating around the Internet. Follow her on Twitter. In Chinese folk legend, the seventh lunar month is the Ghost Month. It is said that every year on the first day of the seventh lunar month, the gate of hell will be wide open and the ghosts will come out until the gate is closed on the 30th day of the month. For the safety of both ghosts and human beings, China has the tradition of worshipping the dead in lunar July since ancient times. In folk China, people would offer sacrifices on the first, second, fifteenth and last day of the Ghost Month. There are many taboos in the Ghost Month. For example, do not wear the clothes with your name, do not pat other people on the shoulder, do not whistle, children and senior citizens should not go out at night. Most people in ancient China believed in ghosts and gods. Legend has it that anyone who dies normally could reincarnate while those who are guilty or die accidentally would become ghosts wandering in the mortal world. Some evil spirits even seize the opportunity to disturb the living souls, causing their death in disasters and accidents. As a result, people who die unexpectedly during this period are regarded “have been taken away by ghosts”. People believe that holding a sacrifice ceremony for these spirits would help them to escape from hell at an early date and prevent them from disturbing the living beings. Therefore, Chinese people would hold sacrifice ceremony and burn money at the roadside during the month to worship the ghosts, which become the customs like “setting lanterns” and “worshipping good brothers”. Since the sacrifice ceremony has the meaning of praying for safety, Chinese people also invite theatrical troupes to play for gods and entertain guests at open-air banquets in addition to worshipping the “good brothers” with substantial offerings at the Ghost Festival, also Zhongyuan Festival, which falls on the 15th day of the 7th lunar month. Nowadays, China encourages frugality; the folk customs are improved and the sacrifice ceremony is simplified. Ancient Chinese people believed natural and man-made disasters were frequent in the 7th lunar month, during which they had feared. Hence, the cultural custom of avoiding anything in this month is formed. In modern society, many taboos fail to stand the test of time but some are still unexplainable with science. For private houses, the Gate of Hell is open on the first day of the Ghost Month, on which ghosts come out to the mortal world and the sacrifice ceremony, grand or simple, is required. The grand sacrifice ceremony means offering a good meal while the simple means of preparing some fruits and desserts to show respect. As the saying goes, there is no such thing as a free lunch. This kind of sacrifice ceremony implies bringing me no trouble once eating my food. For public places, the Gate of Hell is open on the second day of the Ghost Month. In ancient times, shops and government offices held the sacrifice ceremony one day after the private houses to pray for safety and no mysterious case in the month. Zhongyuan Festival, also Ghost Festival, falls on the 15th day of the 7th lunar month. In the night (early morning and late night), ghosts get together and evil spirits reach the peak. On this very day, people would burn money and invoke ancestors and ghosts with sacrifice. Likewise, public places sacrifice on the next day, i.e. the 16th day of the 7th lunar month. On the last day of the 7th lunar month, the Gate of Hell is closed and ghosts go back to the hell from vacation. People offer sacrifice on this day to pray for safety in the rest of days. In the Ghost Month, evil spirits reach the peak. According to the legend of scapegoat, children, senior citizens, weak or sensitive people should not go out at night, or they will be attacked by the evil spirits. Also, you should keep away from entering the water, especially the sea. In short, you should stay away from risks and supernatural games, especially in the night of Ghost Festival. Some people often take items to avoid evil spirits with them, such as an amulet, prayer beads, coarse salt, glutinous rice, cross and lodestone with particular energy. It is better to believe the function of these items as long as your normal life is not affected. For many people, they can feel at ease regardless of the effect. The Assist the Deceased Dharma Rite is used to help the soul of a recently deceased loved one to make their final transition to the next realm. Relieve the grief of loss and unresolved attachments. Clear and strengthen your connection to your ancestors while creating ancestral merit. From August 18 – 26, 2018 at the Lohan Buddhist Temple. According to Chinese tradition, the 7th lunar month is called Ghost month. It is believed that there is a thin veil between the gates of hell/spiritual realms and our Earth realm at this time. Traditionally, rituals and festivals are performed for ghosts and deceased ancestors who are free to roam the Earth at this time. Family members then have a chance to offer prayers, food, and drinks to help deceased relatives and also propitiate unknown wandering ghosts to ward off misfortune and disaster. In keeping with tradition, the Lohan Temple (Spiritual and Cultural Center) will conduct Dharma rites from August 18 to August 25, 2018, from the new moon to the full moon on the 7th lunar month. The rituals performed during this time will help to maintain your connection to and receive blessings from your ancestors who may have attained high spiritual realms, known as ‘ancestral deities’ in some cultures, as well as help extinguish disasters brought about by your deceased relatives who passed away bearing heavy karmas and who are ‘plundering the merits of their descendants’. Any who wish to pay homage to ancestors can make an offering of $32, $72, $108, $300, $600, $900, etc. Your name will remain on an altar at the Lohan Temple (Spiritual and Cultural Center) during the Dharma rites to pay homage to living and deceased parents, the parents of the past 7 lives, and ancestors in general. For those who live in the Las Vegas area, you can visit the temple during any time, and especially during the Dharma rite dates (listed below). You can also bring offerings of food to the temple on the last day of rites (Saturday, August 25th) to participate in the ceremony.